Local: We are 1 block West of Highway 100 on Bluemound Road. Freeway access: Take I-94 to exit 304 (AorB), exit Highway 100, North 1 block to Bluemound Rd., West 1 block to The Forty Winks Inn. From Highway 45: Exit West Watertown Plank Rd., West 3/4 mile to Mayfair Rd.,turn left, travel south to Bluemound Rd, turn right, 2 blocks to The Forty Winks Inn located on southside of street. Welcome to the Forty Winks Inn website. Our motto of comfort and convenience is the key to your business and leisure travel needs. We take pride in providing our guests with a clean, comfortable, and convenient "home away from home", with a warm and friendly atmosphere. We look forward to having you as a guest at The Forty Winks Inn. The Inn was established in 1954 and has been family-owned and operated for 37 years. The building was completely renovated in 1990. We are conveniently located just minutes away from the area's best attractions, business centers, and learning institutions. Whether business or pleasure, we have a long list of comforts in a convenient location. 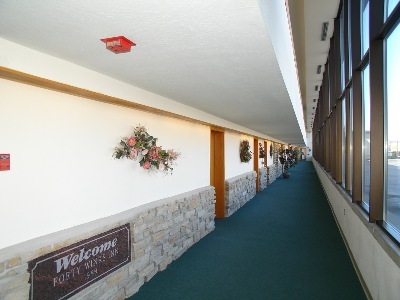 Please click on to The Inn to view our rooms.